In the upcoming months, there is an extraordinary opportunity available for Siddha Yoga students to intensify their sadhana. 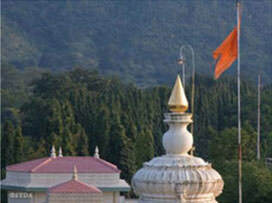 Three Pilgrimage to the Heart Retreats, each one-week long, will be held at Gurudev Siddha Peeth in Ganeshpuri, India. The Pilgrimage to the Heart Retreat is designed for dedicated, self-motivated Siddha Yoga students who wish to experience and contribute to the powerful ashram environment through their active participation in the retreat's daily schedule. In order to support their full engagement with the practices, participants will observe five days of silence. All applications will be carefully considered, based on the applicants' understanding of the purpose of the Pilgrimage to the Heart Retreat and their aspiration to fulfill this aim. Upon arrival and for departure, transportation to and from the Mumbai (Bombay) International Airport is provided. The accommodations in Gurudev Siddha Peeth are simple and comfortable. * Translation may be available if 5 or more approved applicants request it, and is subject to the availability of translators. Please contact your country’s Registration Coordinator for more details.